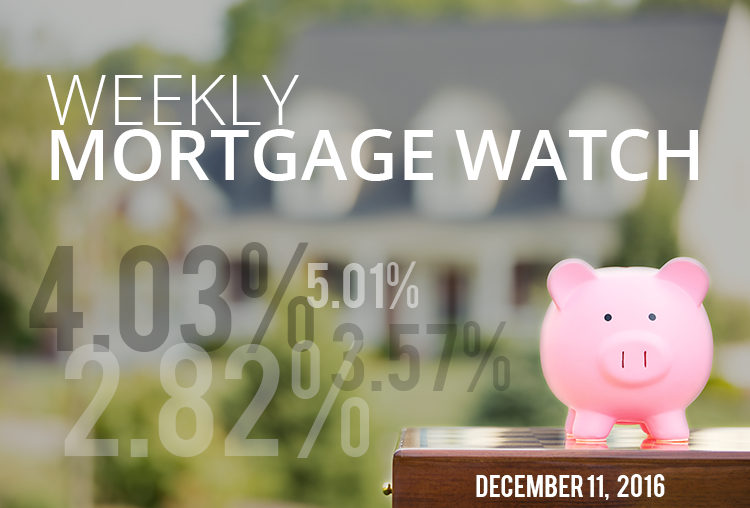 Last week saw mortgage rates move upward slightly, but less drastically than in previous weeks. The most heavily influential economic data came with an increase in the ISM Services Index which posted an increase of 2.4 points, along with another solid increase in Consumer Sentiment. Other news out of Europe and climbing stock markets added to the upward pressure on rates. The Federal Reserve is very likely to announce an increase in its interest rates. The expected increase is priced into the market and the increase will make little difference. However, statements from the Fed will impact rates. If the Fed expresses additional confidence in the economy’s ability to accelerate its own growth, then rates could climb even higher. That could easily be bolstered by better-than-expected readings in Retail Sales or Industrial Production data. Alternatively, if the Fed appears to signal less enthusiasm about future economic prospects, mortgage rates could very easily flatten, with some potential of moving downward, but any decrease would likely be very small. COULD 6.3 MILLION MORE LOANS BEEN ISSUED? According to a recent report from the Urban Institute, over 1 million loans could have been issued last year “if reasonable lending standards had been in place.” Tack on an additional 5.2 million from 2009 to 2014 that lenders failed to make due to tight lending standards. These 6.3 million missed loan opportunities may only be part of the story, as many potential borrowers may have been discouraged by what they have heard and never even attempted to apply for a mortgage loan.